LEDBUY360 24CH 72A DMX-PWM CV Decoder DMX512 Controller by LEDBUY360 at IGWT. Hurry! Limited time offer. Offer valid only while supplies last. LT-880 DMX-PWM CV Decoder converts the unicersal standard DMX512 signal into PWM signal to drive LED. This compact decoder works with DMX512 Console. LT-880 DMX-PWM CV Decoder converts the unicersal standard DMX512 signal into PWM signal to drive LED. This compact decoder works with DMX512 Console. With 256 levels gray scale output per channel, realize 0-100% brightness and various changing effect. 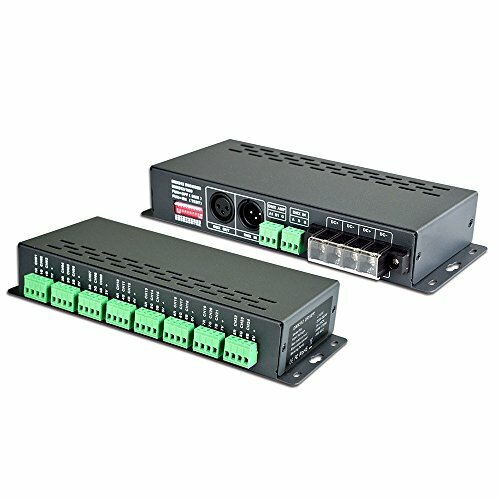 Equiped with DMX standard XLR-3, RJ45, green terminal interface, easy to operate. And it can control single color, bi-color-RGB LED lights. Multi-interface:RJ45, green terminal,XLR3;Multi-channel:3A x 24channel Max 72A. Material obtaining and installation wiring are easier than ever. Control a variety of LED lamps:single-color/bi-color/RGB LED lights. Anti-lighting Strike and ESD Proection:Built-in anti-lightning and ESD Protection circuit, providing all-round protection for the controller, master controller and LED lamps. 850 Frames Per Second: High-speed data processing for the console or master controller, up to 850fps. High PWM Frequency Output: No flicker in camera-shooting lighting environments, widely used in television engineering. View More In Strobe Effects. If you have any questions about this product by LEDBUY360, contact us by completing and submitting the form below. If you are looking for a specif part number, please include it with your message. American DJ Mega Flash DMX 800w Compact DMX Strobe Light+Free Bluetooth Speaker!